Kristie Anne Kenney (born 1955 in Washington, D.C.) graduated from Clemson in 1977 with a Bachelors degree in Political Science. She then went on to get her Masters degree in Latin American studies from Tulane University. She is married to the current United States Ambassador to Colombia, William Brownfield. She speaks both Spanish and French. 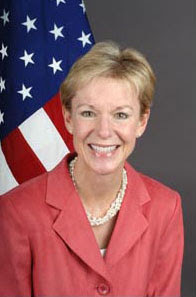 Kristie is the current United States Ambassador to the Republic of the Philippines, and the first woman to hold the job. She was nominated by George W. Bush on November 3, 2005, confirmed by the United States Senate on February 16, 2006, and sworn into office by Secretary Condoleezza Rice on March 6, 2006. On March 17, Kenney arrived in the Philippines to assume her duties as the first female ambassador. Prior to being the US-Philippine Ambassador, Kenney served as the US ambassador to Ecuador. Before working for the United States Foreign Service, she worked as a United States Senate Page, a tour guide in the United States Capitol, an intern in the House of Representatives, and as a staff member of the Senate Human Resources Committee. At the State Department, she was appointed overseas as Economic Counselor at the United States Mission to International Organizations in Geneva, Economic Officer at the U.S. Embassy in Argentina, and Consular officer at the U.S. Embassy in Jamaica. Back home, she was appointed as Director of the State Department Operations Center, a detail to the White House as a member of the National Security Council staff, and Political-Military Officer in the Office of NATO Affairs. Kenney served as Executive Secretary of the State Department before becoming Senior Advisor to the Assistant Secretary for International Narcotics and Law Enforcement. She worked for both Secretaries of State Madeleine Albright and Colin Powell and led the State Department's transition team from the Clinton to Bush Administrations. "Heart broken to think of leaving the Philippines but know it is time for me to plan to return to be with my family. Calling on my FB friends to help me not be sad but to enjoy and savor my remaining months in this lovely country." Kristie A. Kenney is yet another notable Clemson female alum who has accomplished great things in her career after Clemson. No doubt Clemson University played a vital part in setting the stage for such amazing accomplishments.